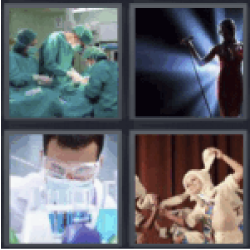 4 Pics 1 Word Doctors surgeons operating on patient in hospital. Woman singing on stage with spotlight. Scientist doing study in a lab. Person in funny ears costume. Find the 4 pics 1 word answers you need and still having fun with the game that has hooked millions of people. 4 pics 1 word doctors.